I’ve never thought of myself as a feminist until recently. My entire life the word itself felt like a curse word, it had always left such a bad taste in my mouth. Feminism. EW! In my generation it can be an excuse for all kinds of sin & selfishness all in the name of being a woman, therefore I had written it out of my vocabulary. It just wasn’t something I ever planned on working into my life. All until it slowly crept into my life. Because these last few months, what being a feminist really means became clear to me. See I am a stay at home, homeschooling mother of 4 kids whose main outside activities are grocery shopping and if things get really crazy, a cup of Starbucks to keep me company. Occasionally, a night out with my Mom friends to have a nice, quiet dinner out. For one 18 month period I was at home taking care of our babies 24-7 so my husband could pursue the chance to own his own company, he only came home to sleep at night while I took care of everything else. That year every duty I had was Mom. Mom. Mom. I would have appeared to most like a doormat, but the reality is, with God’s strength, I had the power to hold it all together! By culture’s definition I am not a feminist. But why not? 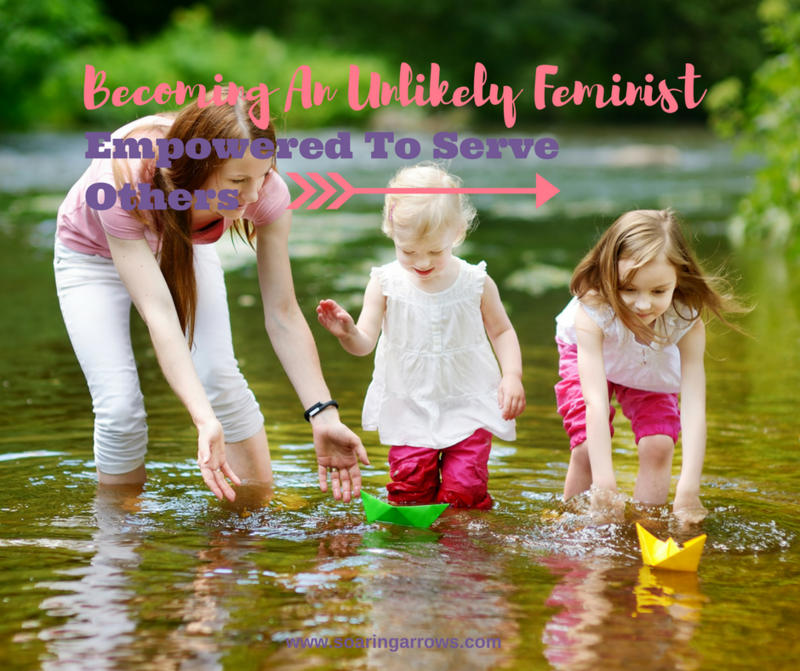 Is devoting my life to my husband & kids NOT being a feminist? I chose this lifestyle. Me. Nobody made me do it, although my husband did insist on me staying at home because he did not grow up with a mom who got to stay at home, it was something he really desired for our family. Despite that, it was my desire, the choice was mine to make and I made the decision readily. My Mom had stayed at home for me & my siblings, which I loved and I wanted to do the same for my children. I’ve heard it said that women who stay at home with their kids don’t care to aspire to anything. That couldn’t be further from the truth. In fact now that I have given my little family a few years to grow out of the seemingly constant pregnancy/baby phase of our family, I can see that now I am able to pursue the talents God has given me. Because I am not bogged down with a job on top of taking care of my family, I am starting to have a bit of time to pursue the things I am most passionate about. In fact I’d venture to say that my “Mom” job has given me a greater passion for my aspirations. At moments, this new feminist feeling has had me a bit afraid. After all, here I am running from feminism and found myself heading straight towards it. Why run from feminism in the first place? What initially was meant to bring women equal rights in our country has flipped a bit farther than is beneficial to us. Women should be given equal rights, unless it becomes at the expense of another. In that case no one should have greater rights than another, which is what modern day feminism has turned into. Women have say over their bodies, they are legally able to murder babies. Women can speak on the same level as a man, we tear our husbands down then wonder why they aren’t acting like strong men anymore. Women can earn a substantial income for the family, then wither it all away on themselves because it is “my” money. Women can have individual pursuits, then find ourselves wondering why we don’t feel more connected to our families. Women can wear & flaunt whatever they please, then ask why men don’t value them for more than their body. Women are supposed to root for other women, so we turn a blind eye and accept the immoral behavior of our female leaders. These are just some of the reasons feminism has left me disgusted and rejecting the entire idea of it. Now I am not saying men aren’t without their issues, that’s not my audience here, territory or topic. Can we have a steady diet of balanced, biblical feminism? March is when the spark of new aspiration lit in me, I’m sure you know the kind. Writing has been something I have loved since high school and it had been years since I had taken the time to mold or shape that into anything one could even call a hobby. You know what’s so cool about that? He got the chance to support me wholeheartedly. So often we steal that chance from our husbands by jumping into something without even asking their opinion, all in the name of feminism, then wonder why our husband isn’t our hero anymore. The Proverbs 31 woman is known for doing All. The. Things. but what made her more precious than jewels? Her husbands heart trusted her and he had no lack of gain. Wow. Balanced, biblical feminism happens not by being The Everything Mom, but by having a husband that trusts you. Can we have equal the value of men and also value our husbands & children by putting them first? Are your aspirations more important than your husbands trust? This week I finally let myself feel like an empowered woman. Tuesday was the day I felt like a real rebel, a feminist to the core. I drove around in my mini van, dressed patriotic, delivering Dreaming Daughter to her Homeschool drama class, ran errands with my kids all because of a life I want to live! Then I did the big thing, I voted in the 2016 presidential election for the man. Yes, in fact voting for the man during this election was a big deal because that meant I didn’t vote for the woman. Here is the thing, now I have accepted myself as a true feminist, which means I will never elect a woman to public office unless I feel she has earned my vote. She did not succeed in doing that, although I admit she was close a time or two or three. Homeschool my kids, empowering because I love learning alongside them each day. Serve & care for my family, empowering because I am the best for the job and it’s the job I want. Spend elaborate amounts of time with my children, empowering because I do not have forever with them but I can choose to use the time I have now. Dress in a way that gives me confidence without being immodest, empowering because I am worthy on the inside therefore I am worth protecting on the outside. Value all life even at the expense of dealing with my own consequences, empowering because it brings justice to a world filled with injustice. Speak words of kindness & goodness over my husband, empowering because I want to have a husband that can view me as a precious jewel! Write with transparent fearlessness, empowering because “it is the truth that sets us free” (John 8:32) and we are all looking for a bit of freedom. At the expense of a legacy of loving. Let’s turn feminism upside down.